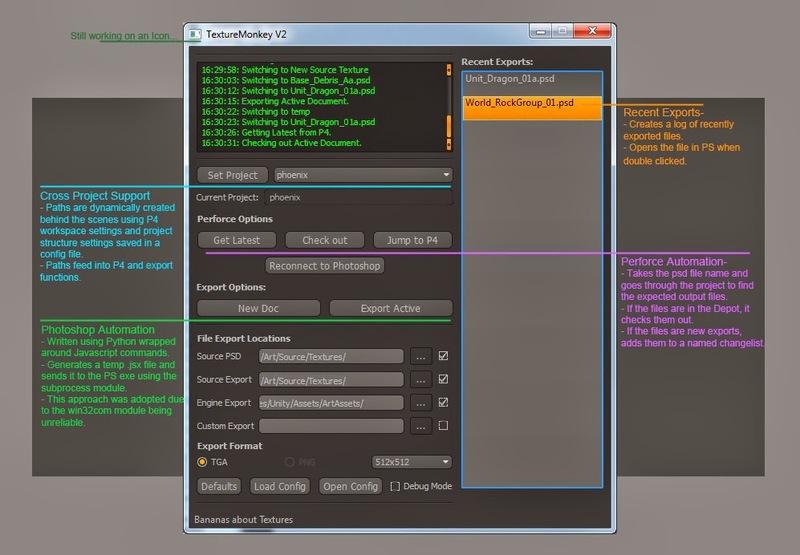 Pete Hanshaw: Texture Monkey: Starting to look like a real tool. Texture Monkey: Starting to look like a real tool. After a little while in the field it came to be pretty apparent that the win32com module can't be relied upon to consistently work on everyone's machines. I spent a good amount of time trying to work out why, but came up with no solution that worked consistently on everyone's workstations. Errors like ('Member not found, None, None) would constantly pop up in their debug feedback, but not on mine. Talk about frustrating. So I got pretty annoyed and just ripped the win32com components out. This was a pretty big undertaking, because apart from the GUI, win32com stuff made up about 80% of the remaining code. The P4 functionality wasn't touched, because its operating through it's own native API. The solution: Photoshop Automation without win32com!